A goal for George, Oundle in the McCain Cup Final. Photo: David Lowndes. 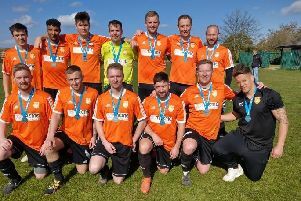 There was a winner, but very little glory from the Peterborough Sunday Morning League’s McCain Cup Final yesterday (April 30). The record books will show the George, Oundle became just the second PSML team to beat West Town this season courtesy of two late goals, but both strikes from Luke Cozzetto and Rob Blades arrived after a 30-man brawl which resulted in a red card for both sides. West Town players troop off after defeat in the McCain Cup Final. Photo: David Lowndes. Trouble between these two teams didn’t come as a complete surprise. A pre-season friendly between them was abandoned early after allegations of a punch being thrown. Jacob Costello of George, Oundle was sent off for violent conduct - he pushed West Town goalkeeper Daniel McCormick in the face - and while leaving the pitch it’s alleged he punched a West Town player in the mouth which prompted a mass confrontation between players and officials on both sides. McCormick was dismissed for stamping on a George player during the melee. George countered with an allegation of spit being aimed at Costello. West Town manager Vinny Price said: “The trouble started as the George player who was sent off was allowed to walk across the pitch towards the dug-outs rather than being sent to the dressing rooms. He then punched our player as he left the field. This caused the 30-man punch-up. “This sort of incident has no place at any level of football, but my boys reacted in defence of our player. George, Oundle manager Jim Davey added: “Rather bittersweet unfortunately. Our player got sent off for pushing the keeper who went down holding his face and as he was walking off he was spat on which sparked a reaction and then the melee started from there, and it got really out of hand from both sides. League officials have yet to respond to a request for comment. All incidents have been reported to the relevant county FAs. Disrepute charges are likely to be brought against both clubs, while lengthy bans can be expected for Costello and McCormick. Costello is likely to be charged with two red card offences.